Happy Thursday, Everyone! Are you in full Irma preparation mode yet? We are still getting things in order but since I’ve been seeing Fall decor everywhere, I thought I’d share these sweet little Halloween jars I made last year! See how quick and easy they are to make! I’m surprised to see so many pumpkin spiced things and Halloween and Fall decor already! But, I guess it is that time of year. So, with that in mind I thought I’d share again these adorable little halloween jars made from simple pimento jars. The jars are 4 ounces which makes them the perfect small size for this project. Plus, they don’t have paper labels and no strong odors, making them super easy to clean. After I thoroughly wash and dry the jars and lids, I spray paint the lids with a bright orange gloss paint and the knobs with a satin black paint. Just make sure when you are painting the lids and knobs to spray the undersides so all of the surfaces are covered. Once dry, I glue the knobs in the center of each lid using E6000 glue. Then fill them with candy corn or your choice of other yummy Halloween treats! I think the candy corn looks perfect with this color combination. If you like you can add raffia or twine around the neck of the jars for a little added texture and a finishing touch. Not only do these little candy jars make fun gifts, but they make cute and colorful decorations as well! 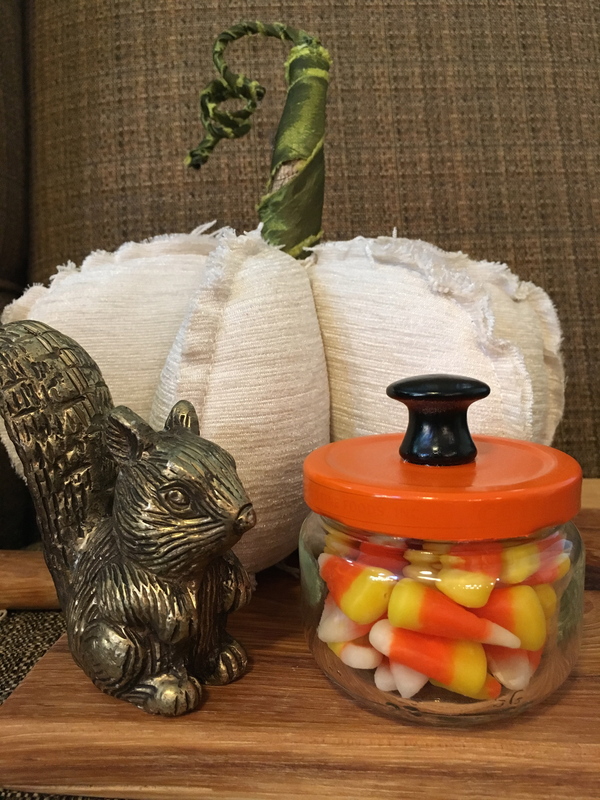 I love the little brass squirrel and cloth pumpkin. I think the squirrel is wondering how he can get inside that candy jar? So, may I suggest you make some homemade pimento cheese dip and save those little jars for this easy craft? You can find the recipe here: Southern Style Pimento Cheese And, with Halloween right around the corner, I bet young kids would love to help make these fun jars. Wouldn’t they make a great teacher’s gift? Last year I made a several of these and gave them to my fairy god-children. I guess we’d better get busy, right? Chestnuts Roasting on an open fire…..